Chromatography is the general name given to the methods by which two or more compounds in a mixture are physically separated by distributing themselves between two phases: a stationary phase which can be a solid or liquid supported on a solid and a mobile phase, either a gas or a liquid which flows continuously around the stationary phase. The separation of the individual components results from the relative difference in affinity for the stationary phase. In liquid chromatography (LC), the flowing or mobile phase is a liquid, whereas in gas chromatography (GC) is a gas. Detection of the separated components in both GC and LC can be made by various means, one of the most sensitive being a mass spectrometer. The mass spectrometer can detect and record the relative masses and abundances of ions that are produced from compounds that have been separated using chromatography giving structural information. The current instrumentation is a Varian 1200L. The triple quadrupole MS allows analysis via MS or MS-MS, with the potential for detection in the parts per billion (ppb) range and access to more extensive fragmentation information. The GC-MS system is equipped to allow for either Electron Ionization (EI), or Chemical Ionization (CI) both in either positive or negative ion mode. In addition the GC can be run as a stand-alone component, with detection using a Flame Ionization Detector (FID). The HPLC system can also be run coupled to the MS or with its own internal UV detector. HPLC offers the ability to analyse compounds which do not lend themselves to GC methods, and can cope with compounds that are less thermally stable, that have a high molecular mass, or that are highly polar. The LC-MS can be equipped with APCI or electrospray sources. Other detectors available include a UV-VIS Prostart 325, a Fluorescence Jasco FP-2020 and a GBC LC 1240 Refractive Index Detector. 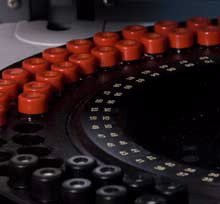 Applications of these techniques include, identification and quantification of compounds in environmental samples (eg pesticides, oils and organic pollutants) and medical applications (eg drugs and bioindicators).